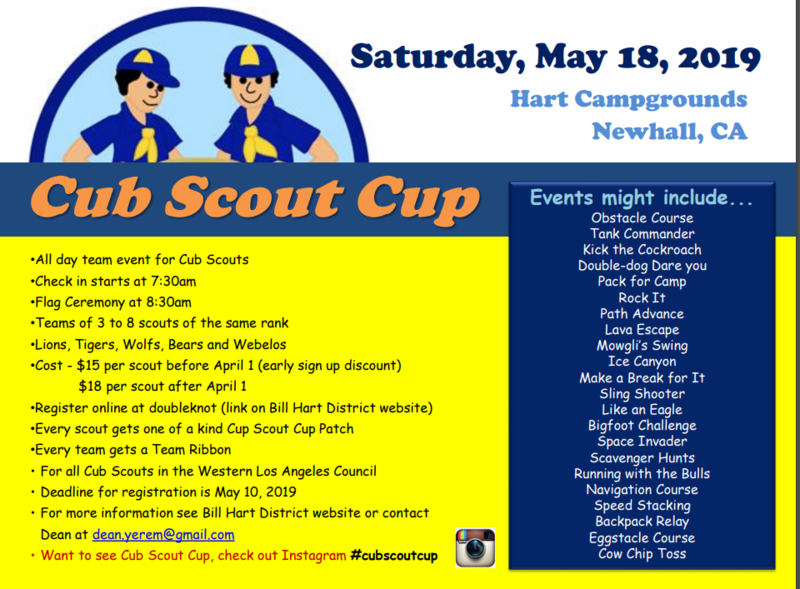 What is Cub Scout Cup? It is the greatest Cub Scout event for the past twelve years that matches all teams against other teams of the same rank. Tigers are only competing against Tigers and Webelos are only competing against Webelos!! Fifteen plus events challenging your scouts in team building events like obstacle courses, relay races and mental challenges of their scout skills. Plus, your scouts will learn how to fold a flag. Teams are encouraged to have fun crazy team names, flags, cheers and yells to try and win the Spirit Cup for each rank. Awards are given out at the Bill Hart Roundtable in June. A picture is worth a thousand words, so check out our hashtag, #cubscoutcup for more than 350 photos of previous years. Before 4/1/2019 a discount of $3.00 will apply to all Cub Scouts Registrants. Generally there are no refunds for this event.